Today I am excited and honored to share a guest post from fellow creative, mom and friend- Liz Lamoreux! My daughter Ellie Jane is almost three and has been telling me for a while now that she wants to “art journal like Mama.” We have a big sketchbook that she uses for coloring and painting and a few small journals for stickers and drawing, but I know she really wanted a journal with photos and pockets and lots of washi tape like the journals I play in. So I gathered some supplies and on Saturday evening told her that Sunday morning was going to be a special surprise playdate in the studio for us (talking about the next day is something we do each evening). 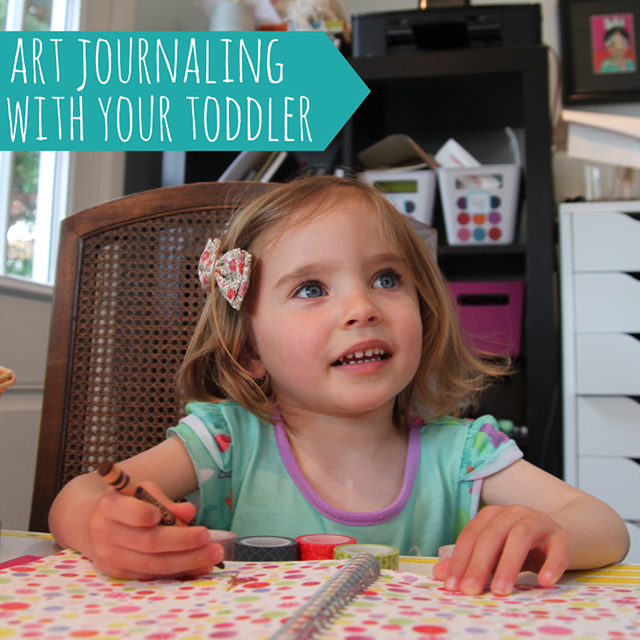 Here’s a glimpse into our adventure that I hope will give you some ideas for art journaling with the kids in your life. Ellie Jane was immediately ready to dive in with the crayons and stickers. After a few minutes, I began to show her the photos, and this is where the unexpected magic happened. I quickly started writing down her narration. Sometimes on a little tag and sometimes on the actual photo (with an American Crafts Slick Writer). We talked about five or six photos (I’d printed about 15), and she was ready for washi tape, so we started taping them into the journal. She LOVES putting the washi tape down, and it has been fun to watch her go from creating a big pile of it on a piece of paper to recently realizing she can also use it to adhere things so they don’t fall off the paper. I still rip it for her, but she chooses the colors/patterns and where she wants to put them. Next, she spent some time drawing on the tags. She wanted to write letters (which is a new thing) and wanted me to write down exactly what she had drawn. This was pretty fantastic as she said things like “This is two running around letters Bs.” Then we taped down the tags. She started to focus on Mickey Mouse and the Disney Store as answers for favorite adventure, favorite thing to do, best friend, etc, so I look forward to asking these questions again in a few months (or even weeks) and noting the changes. I can imagine creating an entire small journal where I ask her these questions a few times a year while she is younger and then maybe yearly as she gets older. 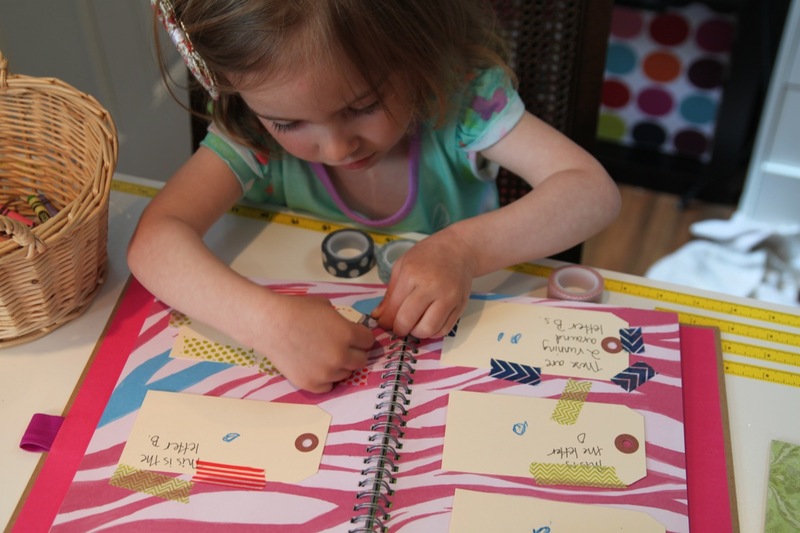 She was really interested in adding pockets and places for “secret treasures.” So we added them with glue and washi tape on several pages. 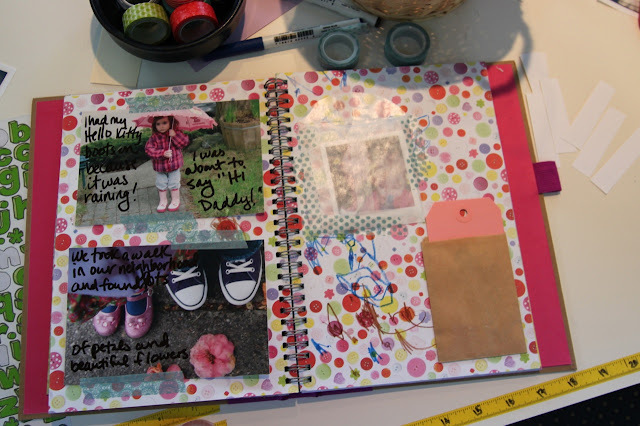 And we put the extra photos in a pocket in the front cover so we can look at them the next time we journal together. • You might tape the pictures in the journal ahead of time and just ask for descriptions. If your child isn’t talking yet, you could write down some descriptors or leave space to add them later. • Have your child draw pictures and insert captions so you will remember what they’ve created. • You could turn the entire journal into a storybook that they illustrate and narrate. • You could capture an entire trip or the summer in one journal. 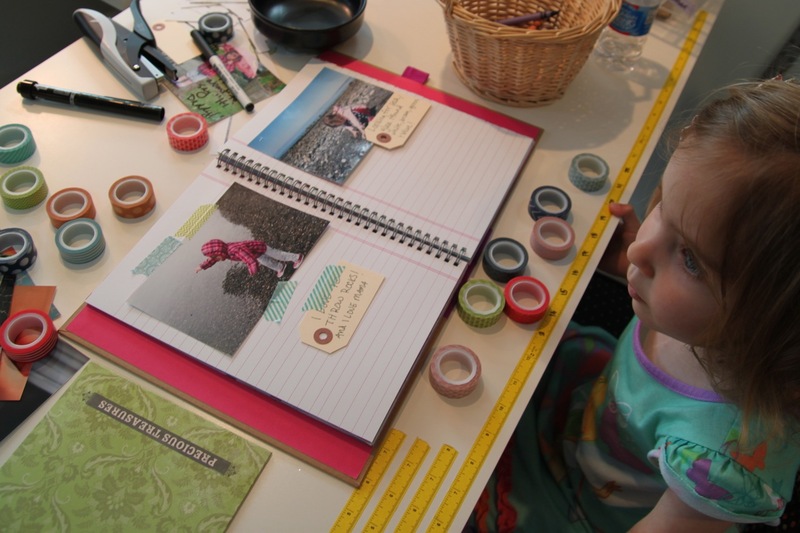 Take it with you on planes or to the park and have your child decorate pages and tape found items into the journal. Then you can add photos from that day or trip later. Most importantly have fun! Being prepared with several activities really helped me remain patient because we could easily move onto something else when Ellie became distracted. And letting go of the control of the experience (aka remembering that this is her journal and not mine) helped me to just be really present and create space for her to simply enjoy creating. About Liz Lamoreux: I’m a retreat host, jewelry artist, and the author of Inner Excavation: Explore Your Self Through Photography, Poetry, and Mixed Media. In this moment, you might find me dancing in my studio to Mumford and Sons, making muffins with my almost three-year-old daughter, writing a poem, or deeply enjoying the quiet found in a cup of tea. Connect with me at www.lizlamoreux.com. In June, I’m teaching Water Your Toddler Mama Soul, a 10-day ecourse just for moms of toddlers that focuses on ways to tell our stories during these years where we have little time to ourselves. There will be daily photography prompts and self-care ideas that will help you reconnect with yourself in the midst of all that a day with a toddler (or two or three) brings, plus we'll be gathering in a private Facebook community that will continue after the course. Learn more and register here. I would have loved this when my kids were little. It'll be a treasure for her as she grows too. i love how liz and ellie play together and soak up studio time. i have seen all of this first hand, staying at liz's during retreats. and as a mama of older pixies, it takes me back to those moments when we all sat and created together. of course i so wish washi tape had been in the picture! What a wonderful post! Nice work, Liz! Your daughter is a cutie, too! Thank you so much for sharing ,I cant wait to get creating with my nephew! Oh, I love this! I do my own variation of this idea. I let my kids take turns having pages in my art journal to draw whatever they want. They think it's AWESOME to get to use my pens and journal, and I get to preserve a little piece of who they are right now. 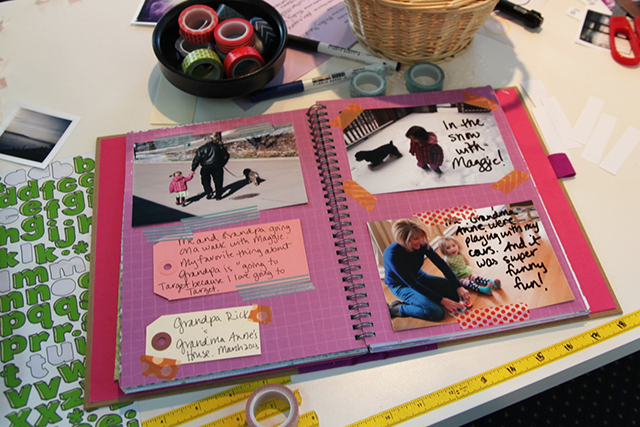 It ends up being a really cool family journal. 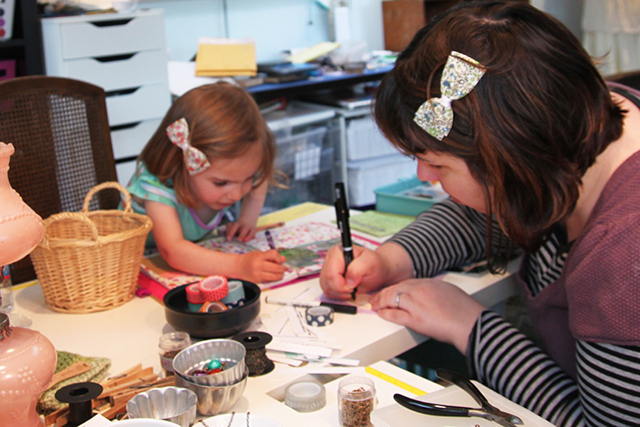 I loved reading this, so sweet seeing mom and daughter creating together. Thanks for sharing and giving us tips on how to start. Thank you for such a lovely post. I loved reading the comments on each photo and that you took the time to write them down. 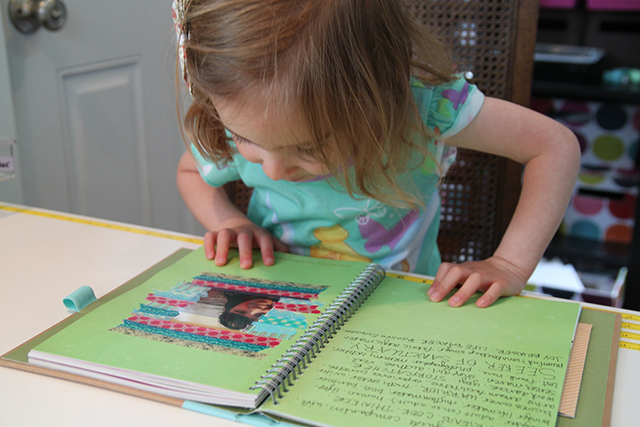 My grand daughters are 3.5 and 2, I look forward to making a journal with them. Thank you for the inspiration. This is just beautiful! Thank you for sharing such a precious time. This is BRILLIANT!! This definately something that I can do when ever I have kids!! Love, love, LOVE this!! Good job with the post!